The Poly P Scholarship, established in 2012, has grown to two annual $1,000 educational awards – one for a young man and one for a young woman. It is funded by University alumni of the recently closed Delta Sigma Phi Fraternity Chapter, and their wives (1950-2018). The awards provide DSP alumni a collective means to give-back to the University in a manner that honors our older Brothers who built the P in 1957 – and demonstrates the importance of philanthropy to all students. 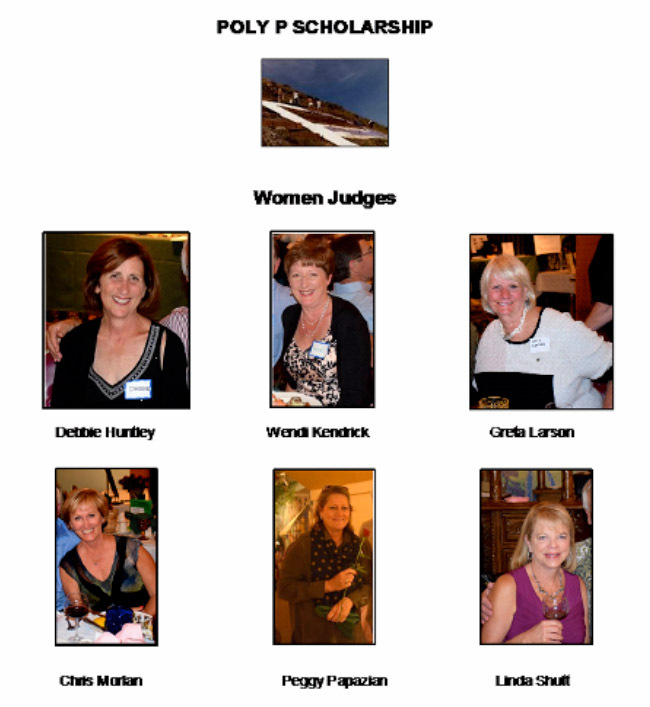 We recognize and sincerely thank the following Poly P Patrons. Their thoughtful donations, and the support of other Delta Sigs who attend our fundraising dinners, make this award possible. The threshold to become a Poly P Patron is $100 in net donation. Patrons can directly donate, or provide an auction item, or be the winning bidder on an auction item that yields at least a $100 net value toward the scholarship fund. One of the oldest traditions at the University is hiking to the “P”, located on Poly Mountain above campus. This symbol of pride for Poly students is one of the oldest hillside initials on the West Coast, dating to 1919. In 1919, local high school students formed an “H” on Poly Mountain from large stones, and University students changed it to a “P”. In the early 1920’s, a 24 by 40 foot “P” with a stone perimeter and lime-filled interior was built. This version was later replaced with white-washed barn doors to form the college’s “Block P”. Over time the “Block P” began to fall apart. 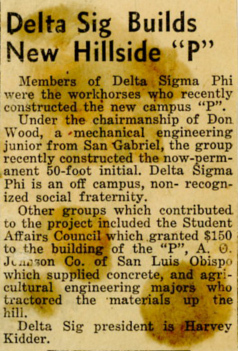 In 1957 the men of Delta Sigma Phi fraternity took the initiative to enlarge and reconstruct the “P” out of concrete. With donated supplies from local businesses, Delta Sigma Phi designed and built the modern “Poly P”. The two black and white photos show 1957 construction. Throughout the Spring of 1957, and with transport assistance from Ag Engineering tractors, Delta Sigs labored through thousands of pounds of concrete and cinder blocks to complete this project. On May 3, 1957, the new 50 by 35 foot “Poly P” was unveiled to campus and community. The community responded positively to the new icon, thanking Delta Sigma Phi for their hard work and dedication. The following article appeared in San Luis Obispo’s local newspaper, the Telegram Tribune, in commemoration of this achievement. In July 2008 the second annual DSP Ol’ Guys Reunion was held - in San Diego. Hosted by Greg “Deuce” and Barb Piers, F’67, twenty-seven Yitbos couples enjoyed the Del Mar Race Track, sight-seeing, and a dinner-cruise on the Bay. In March 2008 our Brother Joe “Tickles” Gomes, F’70, suddenly passed away. Several Brothers attended his memorial services in California and in Georgia. This article is still being developed - and you are invited to contribute. In April 2008 ACB President Jonathan “Peabody” Monfort, F’81, was honored by the Active Chapter as the Outstanding Alumni of the year. In October 2007 Chris “Yabut” Patterson, W’73, and wife Carol, hosted an Ol’ Guys Reunion weekend in Placerville, CA. Fourteen couples made the Cary House Hotel their base and sampled area wineries, restaurants, bars, and a golf course! Brother Ed Sauer, W’55, and wife are now full-time RV’ers and loving it. They can be reached at: efsauer@gmail.com. Brother Ted “Fingers” Palmer, S’60, has built a modest second home in Tarpon Springs, Florida, along the water. He’s got a boat and loves to fish. His seasonal phone number there is 702-526-6322. Brother Pete “Cofu” Marmas, W’71, had surgery in 2007 for an oral tumor. He’s recovered well. He and wife Mary can be reached at: mmarmas@aol.com. Brother Wayne “Dizzy” Kendrick, F’72, retired in February 2007 after a fine 32 year run with the same company. He spends his days volunteering, preparing plans for a new home in the Texas Hill Country, cooking, and riding motorcycles. His post-retirement email address is: whkendri@gmail.com. The “Poly P Scholarship” is funded by University's alumni of the student organization that built the modern Poly P in 1957: Delta Sigma Phi Fraternity. Our goal is to provide a $1,000 non-renewable, annual, scholarship to one deserving incoming male student and one deserving, incoming, female student. All incoming students are eligible regardless of age or educational background. For example, applicants can enter directly from high school, or junior or community colleges, or transfer from a four-year institution, enter after military service, enter from the workforce, etc. The sole criteria will be merit and need. Collegiate student-club, fraternal or sorority affiliations at the University, unlikely by an entering student, are not part of the selection criteria. Merit must be based on accomplishments prior to starting course studies at the University. The scholarship winners (one man and one woman), and runners-up, are determined during the Fall-to-Winter Quarter break. The funds are made available early in Winter Quarter. The two winners (one man and one woman) must provide evidence of achieving at least a 3.0 GPA on 12 or more units during Fall Quarter to collect the award. Applicants are asked to use the Poly P Scholarship application and submit it electronically to the review board no later than midnight, Friday, December 7, 2018. The application asks you to list those accomplishments you consider to show merit, any work experience, and your financial need. All the information you will need is in the following form. The two candidate pools, men and women, will be reduced to a quarter-final list, then a semi-finalist list, then a top 10 finalist list. Male alumni judges will review applications from young men, and women judges, primarily educators, will review applications from young women. The two scholarship administrators, Mr. and Mrs. Patterson, do not vote. The young man and young woman who each win the first-place award of $1,000 must subsequently complete a Fall Quarter course-load of at least 12 units at a minimum GPA of 3.0 to be eligible to receive the scholarship. Upon providing this evidence to the scholarship administrator, funds will be made available. If either first-place man or woman winner fails to meet this modest academic standard, runners-up will be contacted in the order of their finish.